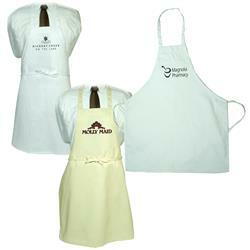 One of our best selling custom aprons now in white and natural. 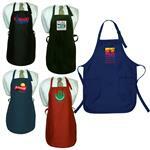 For the Gourmet Cook, this apron features 55% cotton/45% polyester 7.5 oz. twill fabric, Two waist-level front pockets with 1" wide adjustable neck strap and 24" waist ties. This is a great chefs apron! Typical Imprint Area(s): 6" W x 6" H.